What’s ‘IF’ Got to Do With It? Regrets… By our dear Sheikh Google’s definition, regret is “a feeling of sadness, repentance, or disappointment over something that has happened or been done”. We are humans. We learn everyday. We make mistakes. we apologize. We forgive. We forget. We cry. We move on. We remember our lessons.We go through the motions over and over again, till the day we perish. Sometimes we have regrets, and some carry them to the grave. Cheer up! We are humans and being humans, we need to remind ourselves that we are still ‘works in progress’. Thus, regret should be treated in a different light, instead of lamenting over it ceaselessly. No more tears, no more bitterness, no more if-onlys and could-have-beens. Tears will eventually dry and wounds definitely will heal… given time. 1. I wish I had not worked so hard. 2. I wish I’d stayed in touch with my friends. 3. I wish I’d be happier. 4. I wish I’d the courage to express my true self. 5. I wish I’d led a life true to my dreams, and not what others expected of me. Bells ringing, yet? Do we see ourselves becoming just that? Does it resonate something in us? As I was watching McGonigal’s presentation, I was wondering of my own impending death later, (much later, I pray). My end, I pray, will be more peaceful and dignified. Now that we have an idea (data/information), thanks to her research, what of it? What are we going to do with it? A beautiful end with no regrets, hopefully! At present it is best we embrace regret wholeheartedly, rather when it is too late for us to do anything. Embrace? Oh, yes! Dry your tears (if any) now. Go through the above list or we can make our own list which will definitely be better. Let’s identify and acknowledge the flaws in our requests/du’as. Next we can try performing the SWOT analysis in relation to what had gone wrong. Myself included, stopped short on matters pertaining only to business when in fact it is a useful tool to be applied in our personal lives. Oooops… there is something similar in AMC/Platinum classes, but using a more holistic approach whether the participants realize it or not. Then, it is back to the ‘war room’ to re-think, re-design and re-strategize for a clearer and happier ending. No regrets, right? Hence, the end justifies the means, holds true… eh? Generally we want enough personal quality connection and bonding time for ourselves, with family and friends. We want to be happier by our very own standard. We want to be our best-selves (not just to be ourselves). We want to live the way we always wish. We want to be remembered fondly by others. As our needs and wants vary, it is better to be clear on our wants. Definitions are important as they frame the actions needed to realizing the things we desire in our lives. They should be clear. My definitions of ‘enough’, ‘happy’, ‘best’ might be slightly different from those of the dictionary. Of course, different from Sheikh Google’s. After all, we do have varying standards due to our own unique lives and experiences. Hence, let’s pray that we get to live the lives we want. Then, we live and enjoy the lives we planned. I am positive that the lives we all planned is beautiful; filled with beautiful and meaningful moments. 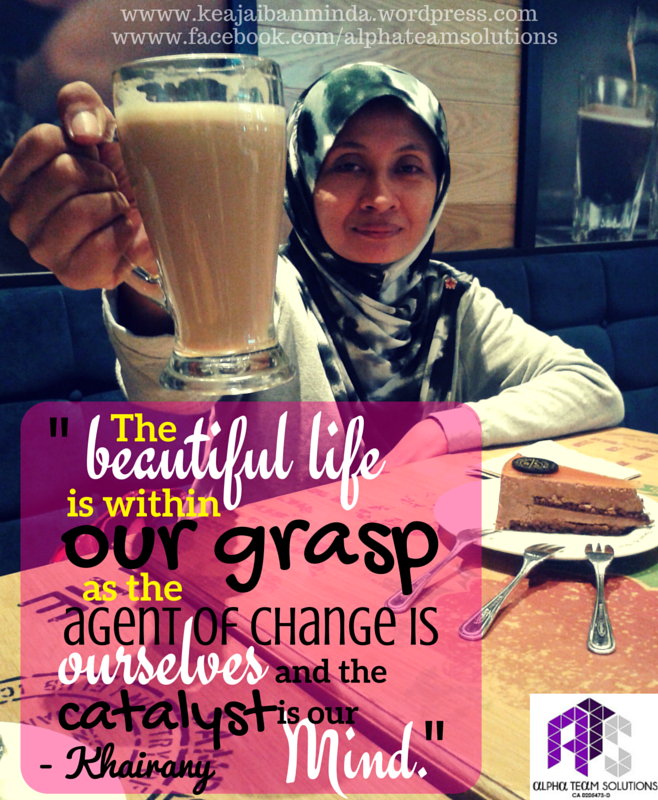 The beautiful life is within our grasp as the agent of change is ourselves and the catalyst is our Mind. As for me: Yes, I learn. I am learning and I will continue learning… as I am work in progress! This entry was posted in Inspiration, Master Minda, Power Minda, Training Minda and tagged AMC, data, Du'a, google, holistic, Jane McGonigal, learning, Platinum, progress, strategize, SWOT analysis, TED, war room, WIP, work in progress. Bookmark the permalink.